Scott Peterson, an ophthalmologist, was a student in my open online course on modern and contemporary poetry last fall (“ModPo”). We studied William Carlos Williams’s poem “Smell!” in that course, and naturally there was a lively discussion of WCW's nose and its various meanings and functions. Scott then told me that since college he has been passionate about collecting Williams-related items. His undergraduate work on Paterson was published “way back in 1967,” as he puts it. 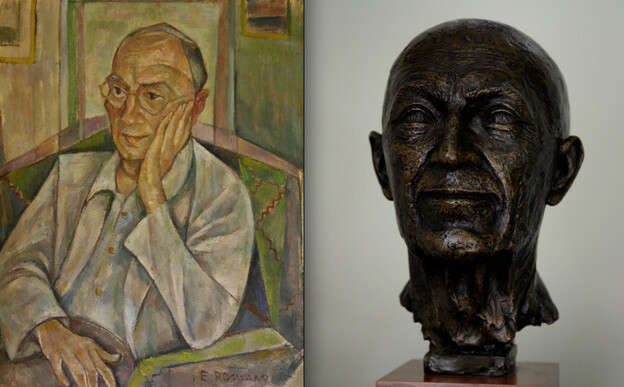 Among his Williams holdings are a bronze bust of the poet (Scott cannot remember the artist’s name) and Emmanuel Romano's well-known portrait in oil. Scott has kindly given me permission to publish images of the sculpture and the painting. Romano wrote in his own diary (entry of September 27) that he was “disturb[ed]” by “the reflection of the light in [WCW’s] eyeglasses.” Take the glasses off, the painter thought, and he would lose the look of “boyish enthusiasm” and would also lose, Romano felt, the look of the poet’s mother's “silky independence” and her dark Caribbean features which the painter felt “revealed themselves” in the portrait.